All-mail-in voting has arrived in the red-rock bluffs and canyons of San Juan County, Utah, which overlaps the Navajo Nation’s reservation. 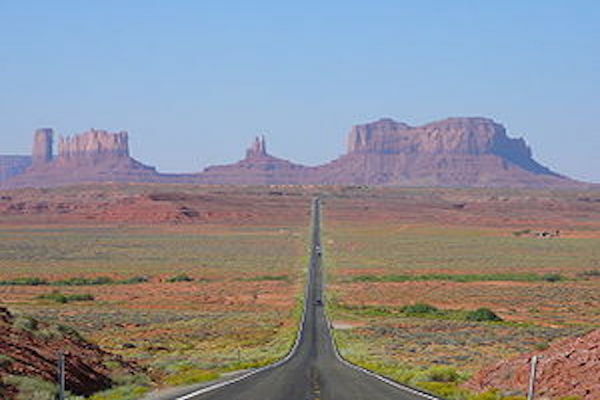 In 2014, the county sent voters mail-in ballots for the general election, while closing local precincts in the shadow of Red Mesa’s ruddy flat-topped butte; in Monument Valley, the fabled location for John Ford Westerns; and in other towns and hamlets. Just one polling place remained open, in the county seat, Monticello, in the predominantly white northern portion of the county. Also gone were 20-some election judges and translators who had provided voting help and federally mandated language assistance to non-English-speaking Navajos. Just one part-time official interpreter was left to cover about 8,000 square miles—an area nearly the size of Massachusetts. As states and counties around the nation increasingly offer voters convenient ways to cast a ballot—early voting, in-person absentee voting, vote-by-mail—Native people find themselves shut out, according to an In These Times story, “The Missing Native Vote.” Since 2012, Natives have sued three times in federal court to obtain in-person absentee voting on reservations, claiming that offering this option only in distant, off-reservation county seats means they do not have voting rights that are equal to that of non-Natives. The Department of Justice has proposed legislation to remedy this problem, according to a Rural America In These Times article. Language assistance is another hurdle for non-English-speaking Native voters. It’s required by the Voting Rights Act, but in practice may not be offered. In 2014, Alaska Natives won a court decision reaffirming their right to have the state give them election information in their own languages. As a result, Native voters in Alaska were credited with helping elect a Native lieutenant governor, protect the vast Bristol Bay region from mining and raise the state’s minimum wage. On Election Day, some Navajo voters in Red Mesa showed up at their old precinct location, says Herman Farley, president of Red Mesa Chapter, a Navajo Nation subdivision. Either they hadn’t heard about the vote-by-mail requirement, or they had heard but hadn’t received a ballot, Farley recalled. At that moment, the voters had two options. They could give up on participating in the election or drive the three-hour round trip to the county seat—assuming they had the gas money to do so. Meanwhile, voters left in the lurch in the Navajo Mountain community, in the remote southwestern corner of the county, faced a nine-hour round trip to Monticello. When the dust cleared after the 2014 general election, the county’s official results showed that Red Mesa’s voter turnout (that is, the county’s figures for level of participation among voters it had deemed “active” via a mail-in process) was down. Red Mesa lost 15 percent turnout over 2006 and 6 percent over 2010, the most recent non-presidential contests. Red Mesa was among the five majority-Navajo precincts, out of seven, where election participation was lower than in 2006. The largest drop was 20 percent. When compared to 2010, turnout for 2014 fell as much as 26 percent in four majority-Navajo precincts. In the other three, turnout rose between 16 and 20 percent—probably because voters there were interested in a local race, according to James Francom, a spokesperson for the San Juan County Clerk’s office. Voting by mail was more consistently successful in majority-white areas, with 2014 election participation rising between 2 and 39 percent in 9 of 10 precincts over 2006 and (after two mostly white precincts were split) in 7 of 12 precincts over 2010 figures. Also in comparison to 2010, turnout held even in one more predominantly white precinct. Losses were generally minimal. In the end, white voting increases appear to have been the force that pushed the county’s turnout up about 5 percent—from 59 percent in 2010 to 64 percent in 2014. This helped ensure that the three seats on the county commission—and its control over county resources—would remain occupied by two whites and one Native, even though the county is about evenly divided between the two population groups, according to both the U.S. Census and the Navajo Nation. The county has never had two Navajo commissioners, according to the Navajo Nation Human Rights Commission (NNHRC). When civil-rights attorney Maya Kane, of the law firm Maynes, Bradford, Shipps and Sheftel, set out to determine what had gone awry for San Juan County’s Navajo voters, she found plenty of leaks in the ballot pipeline. Kane learned that impoverished Navajos may share P.O. boxes or use general delivery and worried that this lowered the likelihood that they received essential election communications, including voter-registration information and the ballot itself. “If anything was off about a voter’s registration—an incorrect address or middle initial, for example—it had to be corrected in order to receive a ballot,” Kane says. Exacerbating these difficulties are the multi-hour round trips some Navajos make to area post offices to pick up their mail. As a result, Kane learned, they may go only every few weeks, cutting their chances of receiving election communications in time to register or vote. After reservation voters mailed their ballots, the items sometimes took the scenic route. While inspecting 2014 election-related correspondence at the county clerk’s office, Kane found pieces with postal-service notations showing they had meandered to Monticello via other counties and even other states, arriving weeks or months after Election Day. Some items were postmarked at the facility where they were dropped off; others were postmarked at another post office down the line, possibly causing a ballot to miss the deadline. In the precincts of Monticello and Blanding, where the bulk of San Juan County’s white voters live, ballots typically had one-day service in both directions, with postmarks reflecting the day they were mailed, according to Monticello postmistress Dorothy Cannon. “We know how important they are,” she says. Vote-by-mail systems are notoriously unreliable, according to Jean Schroedel, a political science professor at Claremont Graduate University, in California. In a 2014 paper, she analyzes recent scholarship showing ways the process can be derailed—when ballots don’t get through to voters or back to the election official, when ballots are disqualified by missing signatures and other errors that could have been corrected during precinct voting, and more. Slightly more than 20 percent of attempts to vote by mail fail, Schroedel writes. According to county commissioner Phil Lyman, the county made special efforts to remedy potentially disqualifying mistakes. When Navajo ballots arrived with errors, the county’s interpreter took them to voters’ homes for correction—“even if that meant a 70-mile drive,” Lyman says. The shortfall in language assistance was another major factor in depressing Navajo turnout, according to Farley. “Some of our elders don’t speak or read English,” he says, adding that convoluted proposition language is especially problematic. According to NNHRC Executive Director Leonard Gorman, some voters mistook their English-only ballots for junk mail and discarded them. The election materials did offer non-English-speakers a remedy. English-only print pieces and related Navajo-language radio ads directed them to contact the county via telephone or Internet. That’s a non-starter, according to Farley. “Don’t assume everyone [on the reservation] has Internet or phone,” he says. The county’s part-time interpreter has criticized the dependence on family for language assistance, noting that English-language election terminology doesn’t translate easily into Navajo. To do his job, Navajo Liaison/Elections Coordinator Ed Tapaha uses a 60-page handbook compiled with the aid of fluent Navajo elders—a resource not provided to the public. Says Lyman, “The last election was a test case. We aren’t wedded to vote by mail if something shows us it was worse than what we had.” When asked whether he knew of papers such as Schroedel’s indicating that better-off, better-educated voters participate more readily in mail-in elections, he said it was the first he’d heard of that. San Juan County is no stranger to voting-rights complaints. It is one of the jurisdictions—states, counties, schools boards and more—that have fought scores of Native lawsuits since the passage of the Voting Rights Act in 1965, according to University of Utah political science professor Daniel McCool, writing in Native Vote: American Indians, the Voting Rights Act, and the Right to Vote. Under settlements negotiated in two Department of Justice lawsuits filed in the 1980s, San Juan County revamped its district structure to improve Navajo election participation and promised to provide language assistance. County elections were under DOJ oversight until 2002. Nationwide, Natives are struggling for civil rights that are largely settled for other groups. Gaining citizenship in 1924 should have, but didn’t, guarantee suffrage, writes McCool, in Native Vote: “To achieve that, Indians would have to overcome a panoply of state laws, constitutional clauses, and court decisions that blocked the way.” After World War II, Native veterans accelerated the demand for equal rights. At the time, McCool reports, a Navajo vet said, “We went to Hell and back for what? For people back home in America to tell us we can’t vote?” Today, groups including NNHRC, the National Congress of American Indians’ Native Vote project, and the ACLU are still striving to ensure that Natives can cast a ballot and have it counted. In 2012, San Juan County was back in court again. The Navajo Nation and individual plaintiffs sued the county, alleging that it had packed most of its tribal residents into one 95-percent-Navajo super-majority district. This prevents them from ever having a chance to elect a candidate of their choice to more than one of the three seats on the county commission, according to Gorman. This article is written from the ideological viewpoint that each vote is more important than the voter regards it. Why presume that people who pick up their mail once a month are very interested in elections AT ALL? Put a dollar bill in the election packages. They'll get picked up. Pay a dollar for each vote mailed in. They'll be on time. Woodward is telling some porkies. In 2010, Utah had a senatorial and a special gubernatorial election. In 2014, the only statewide race was for AG. Turnout was down in 9 of 13 precincts that were majority white. It was up in 2 of the 3 Monticello precincts - but this was concurrent with major shifts in registration among the 3 precincts. Either large numbers of voters moved, or the precinct boundaries were adjusted. The other two white precincts had tiny numbers of voters - one increased from 4 to 10, and the other from 21 to 23. They were one of 6 small precincts that already had all-mail balloting. The "local race" was the county commissioner race for District 3. Either Woodward looked on dull-eyed when she was told this, or she understood why turnout was high in the district, and it didn't fit her narrative. District 3 is the overwhelmingly-majority Navajo district. In 2014, Navajo precincts were 756 Democratic, to 139 Republican in straight-ticket voting. Since the district is overwhelmingly Democratic, it appears that there is a strong personality component to voting. In 2006, Kenneth Maryboy defeated the incumbent Manuel Morgan in the primary, but Morgan ran as a write-in in the general securing 38% of the vote. In 2010, Maryboy defeated an opponent in the primary and was unopposed in the general election. In 2014, Maryboy finished 3rd in the county caucus and was not on the primary ballot. Rebecca Benally defeated Roger Atcitty in the primary. In the general election, Benally defeated Manuel Morgan, now running as a Republican for the office he had held as a Democrat from 2002 to 2006, Roger Atcitty running as a write-in after losing in the primary, and Kenneth Maryboy running as a write-in after losing in the caucus, and also losing in the primary to become president of the Navajo Nation. So the question is how some areas heard about the 4-way race for county commissioner and Red Mesa did not. A possible source of confusion was the Navajo Nation election also held on November 2, 2014, along with confusion after one of the candidates for president was not constitutionally qualified.